This was my first visit to the office and I was very impressed. My dentist suggested that I come here to see what Dr. Buckner could do. From the moment I walked in the ladies in the front office were so professional and kind. They went out of their way to inform me of a coupon and set an appointment for me that day. Later that afternoon the place was packed, however everyone seemed to work together as a team. Nobody was slacking and the place was clean and organized. They took the time to make sure I knew my way around and took excellent care of me. When I did meet Dr. Buckner, he also was very patient and professional as we went over my medical history. He displayed genuine care and concern for my health and healing with an excellent bedside manner. He seems very knowledgeable and direct, with a plan to get me back to health. I appreciated all the people involved and certainly will be coming back for further adjustments. I have had jaw pains for as long as I can remember, starting when I was 6. In the past couple years it had progressed to where I would get lock jaw while yawning and severe pain when trying to eat. I assumed this was something that could be solved with surgery when I was older and college was paid off, but when a family member recommended Dr. Buckner, I drove the 15 hours to Alabama specifically to see him on a chance it would work. After seeing him four days straight, the improvement was nothing short of a miracle, but he went above and beyond by finding me a chiropractor in Iowa so I can continue my treatment. Words cannot express how thankful and awed I am at the work he does. I am so grateful that I found Dr. Buckner. I have had back issues since I was 15 years old. I was diagnosed with two disc herniations, and at 16 had my first back surgery. At 23, I was playing with my 3 year old, and while playing airplane, twisted while holding her and herniated another disc in my lower back. I was diagnosed with degenerative disc disease and had to have another back surgery. So two back surgeries and several years later, I found myself facing a similar predicament. Pain in my lower back radiating down my leg and in so much pain I found myself anxious and full of despair at that thought of another back surgery. The pain was excruciating, like to the point of tears on multiple occasions and even joking that I would just request that the doctors just cut the nerves so I wouldn’t have to be in pain anymore. If you’ve ever dealt with this pain before, you can attest to the fact that it’s debilitating. While taking time off of work to go to the ER, and make Dr’s appointments, several coworkers had mentioned checking out a chiropractor. 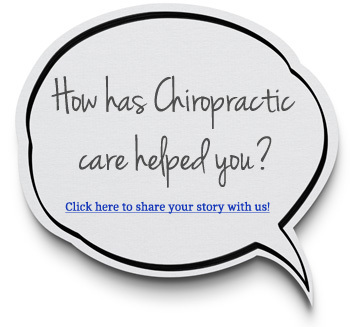 I had never been to a chiropractor, and in fact when I had talked to the orthopedic surgeon when I was younger about it, they said it was the worst thing I could do for my back, so never gave it a second thought. I prayed about it and prayed about it, asking God to please just help me get relief and fix my back once and for all. The next day my husband added me to a local facebook page, where someone was asking for chiropractor suggestions. I took this as a sign and at my appointment with the neurosurgeon, I asked about chiropractics. The PA reported that it was worth looking into and that they had no issues with chiropractors and supported patient’s wishes to seek out additional options, as from their standpoint they would likely suggest surgery. As much as I respect and appreciate the doctors that have seen and treated me in the past, it always felt like their plans were reactive to my back problems and offered no suggestion as to why I was facing these back issues at such a young age or how to prevent additional issues in the future. This time, I was going to avoid surgery at all costs! Dr. Buckner came highly recommended, and as I researched him on the world wide web, I couldn’t find ONE bad review or bad experience, so called to schedule my first appointment. As I hobbled into the office, everyone was great! Very professional and courteous, as if we had been friends for years. I met with Dr. Buckner told him my issues and had my X-ray taken. Then went back to meet with him and review what he saw. As we talked about my issues, my mind was running a mile a minute, fearing he would tell me it would take months to correct or worse- that he wouldn’t be able to treat me or that what he saw wasn’t why I was in pain and he still thought I needed surgery. Much to my surprise, not only did he say he could fix me, but that I would be pain free in as little as three weeks! In that moment, I was overwhelmed with hope and relief and just flooded with emotion, and burst into tears. For More than half of my life I’ve had these issues, and I was FINALLY on my way to recovery. I’ve had two adjustments, and although I still have the pain (for now) I feel better. I can sit and sleep without pain, and maybe even more rewarding- I have HOPE! If you’re considering seeing a chiropractor I IMPLORE you- Come see Dr. Buckner. You will NOT be disappointed! Your staff was so friendly and kind. I’ve never been to a doctors office that the whole staff from check in to check out was so dedicated to helping me or making sure I was comfortable. Dr.Buckner was so friendly and as soon as he adjusted me I felt instant relief. I am so happy I was told about Dr. Buckner and his staff!! My first chiropractic visit, and I’m pleased with my first experience. The staff were very friendly and took the time to explain everything. The facility was clean, neat, and organized. I would recommend Buckner Chiropractic Center to those looking for one. I have had severe migraines and back pain for years, and I can already tell a difference after the first visit. I finally feel like I have hope with Dr. Buckner. Everyone at his office is so helpful and friendly. I highly recommend coming here! I have been going to chiropractors for few years for my pinch nerve condition, I have relocated from NJ, MI, TN and FL, I’m training in AL for few months and needed to get adjusted so I chose Buckner Chiropractic for adjustment and massage. This was by far the best chiropractic experience I ever had (the doctor called me later on in the day to see how I was doing), I highly recommend this place. Dr. Buckner is a skilled practitioner, that understands his customer’s have busy lives and he and his staff do a great job of seeing you and getting you on your way! I have had such a wonderful experience with Dr. Buckner and his staff! When moving to Huntsville, I needed a chiropractor who would truly care about trying to help me feel better, and for my visits to be enjoyable. I struck GOLD! Dr. Buckner’s knowledge and personal care for each patient has helped my neck and back pain, while making me feel like I’m his only patient each time I come to visit. His staff is wonderful, and always willing to work with me on days where I needed to reschedule. I would recommend Dr. Buckner to anyone looking for a knowledgeable, friendly, and personal chiropractor in the Huntsville/Madison area!